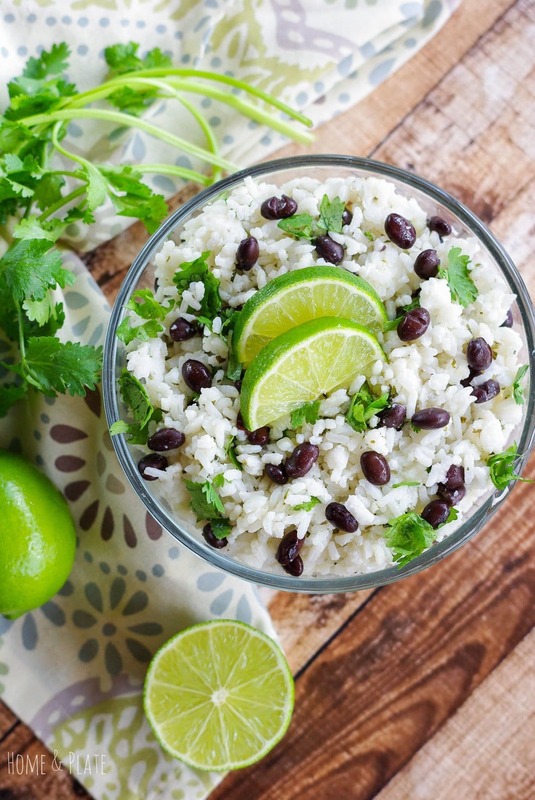 Jazz up plain jasmine rice with black beans by adding fresh squeezed lime juice and chopped cilantro. It’s an easy side dish that takes 20 minutes. You will not believe how fresh lime juice can transform the flavor of this simple side dish. It’s so delicious! It’s the perfect addition to any Mexican dinner. And did I mention it’s healthy! Rice is a common staple in my household. I have two athletes and it’s an easy way to fill their bellies. It also refrigerate so easily. Just reheat it and add your favorite add-ins. 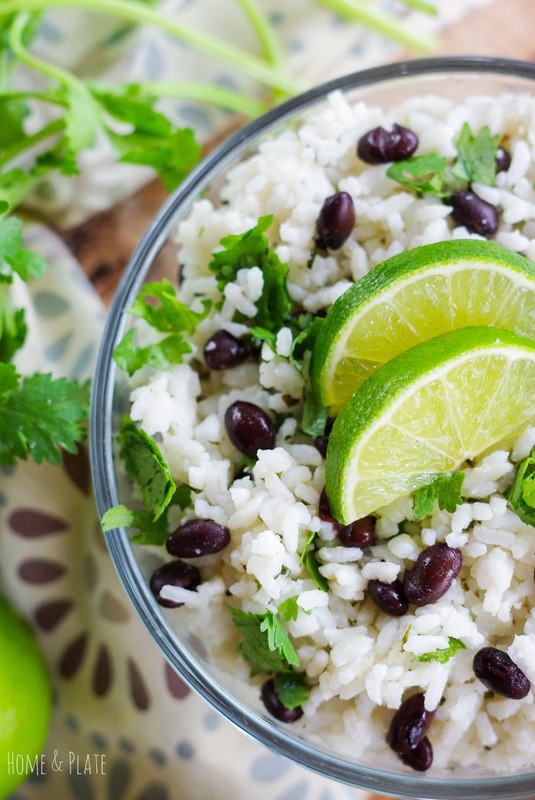 Plain rice can be boring so jazz it up by adding fiber-rich black beans and fresh squeezed lime juice. Sprinkle some chopped cilantro to transform the flavor. ‘Ole! I serve up this easy side dish on taco Tuesdays in my house. It’s great served with burritos, and enchiladas and tacos. I’ve even been known to add fresh chopped tomatoes and avocado to this healthy rice one-pot dish. On fish night, I’ll add fresh chopped mango or pineapple to this rice dish. Top with jerk seasoned mahi mahi and you’ll think you were on a Caribbean island. It’s also delicious with anything off the grill. Mojo pork or cilantro lime marinated chicken are delicious to serve alongside this jasmine rice. Be sure to check out my jasmine rice with plantains and cilantro too! Jasmine rice. The rice aisle should have this by the bag. 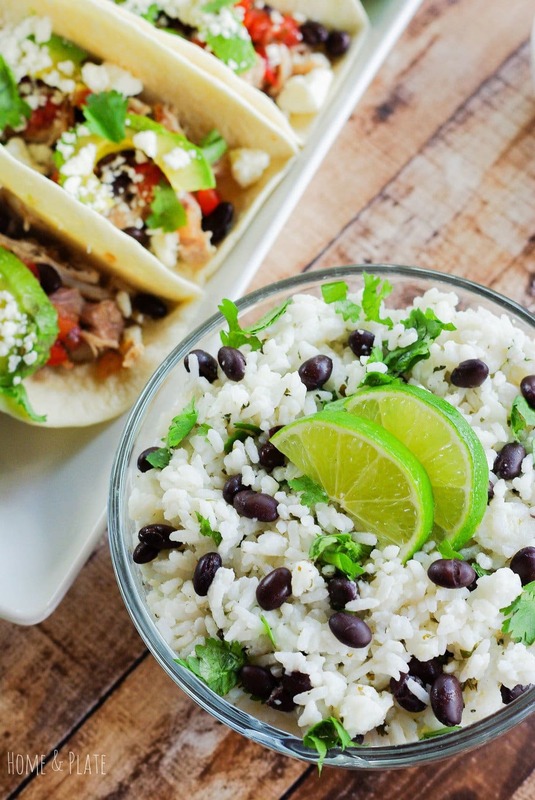 We love the flavor of jasmine rice and prefer it over white rice. Black beans. Grab a few cans of black beans because it’s handy having extra stored at home for when you need it. Limes. Fresh is best. Roll the limes around in your hand to help release the juice before using. Olive oil. You should already have this pantry staple at home. Otherwise, grab a bottle of quality olive oil. Cilantro. The produce section should have fresh cilantro. Grab a bunch and be generous in this recipe! Cook the rice: Mix together the rice, olive oil and water and bring the pot to a boil. Simmer the rice for about 20 minutes. Add the cilantro: Chop the cilantro before stirring in to the rice. Serve: Use it in tacos or burritos or eat it as a side dish. Enjoy! 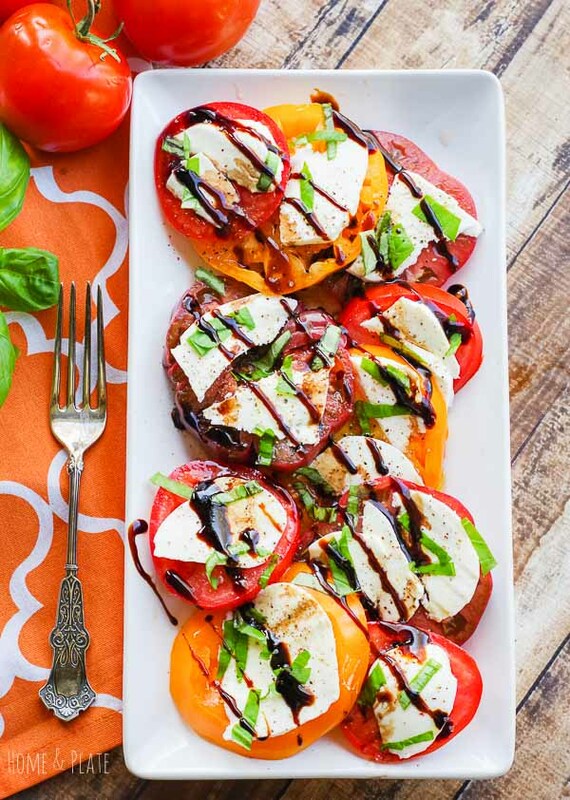 REMEMBER TO SUBSCRIBE TO HOME & PLATE NEWSLETTER FOR FREE AND RECEIVE FRESH RECIPE NOTIFICATIONS DELIVERED INTO YOUR INBOX! If you try a recipe, please use the hashtag #HOMEANDPLATE on INSTAGRAM for a chance to be featured! FOLLOW HOME & PLATE ON FACEBOOK | INSTAGRAM | PINTEREST | TWITTER FOR ALL OF THE LATEST CONTENT, RECIPES AND UPDATES. 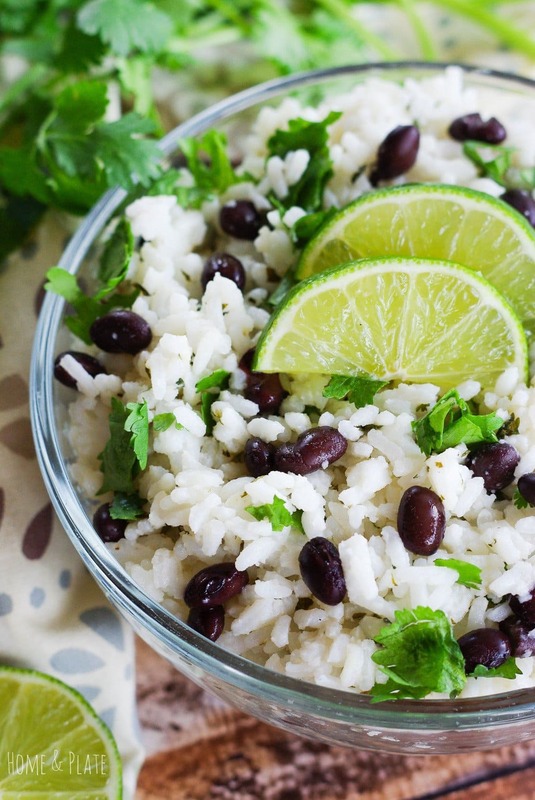 Jazz up plain jasmine rice with black beans by adding fresh squeezed lime juice and chopped cilantro. It's an easy side dish that takes 20 minutes. Mix together two cups of water, 1 tablespoon olive oil and one cup of jasmine rice and bring to a boil. Reduce the heat to low and cover allowing the rice to cook for about 20 minutes. 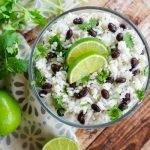 Once the rice has cooked for almost 10 to 15 minutes and the water has evaporated stir in the lime juice, the black beans and cilantro. Finish cooking until the rice is completely cooked and the beans are warm, about 5 minutes more. Simple, fresh and light. This would go really great with grilled chicken! This side dish would go great with grilled chicken, especially marinated chicken. I’m so boring when it comes to rice, this is a great idea to add flavour and colour without lots and lots of extra ingredients. Rice doesn’t have to be boring. Just a few additions can transform plain rice into something super tasty. So delicious Ali!! Love the looks of this. bright and just so sunshiny! Thanks so much. The lime and cilantro adds great flavor. Great with anything Mexican. I could make a meal from jazzing up rice and this looks delicious. Thanks Janette…so simple and an easy side dish or make it a meal! When do you put in the black beans and oil? Thanks so much for your comment. Sometimes it’s my readers who catch my omissions:) I have updated the recipe. Hope you like it. It’s a family favorite of ours. Easy, healthy and delicious.